Today I have to give a shout-out to Miriam Weinstein, author of The Surprising Power of Family Meals. Written in 2005, it is one of the only popular books out there that tries to bridge the research of family dinner with tips that families can really use. It is a well-written inspiration that I reccomend to anyone who cares about food and family. I read it in 2007 when I started this blog and it was relatively hard to find. Weinstein seemed like a voice in the wilderness, someone trying to get at the nitty-gritty of family dinner beyond the platitudes, but it was unclear who was listening. I could never find much follow-up writing about it by her after the book was written. Recently, thanks to a J.M. 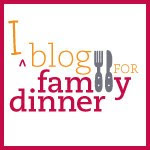 Smuckers company endorsement, she's been give a new slick web platform to spread the word of family dinner at The Power of Family Meals. It's sort of a funny partnership, but I guess Smuckers feels like this is an authentic way to promote breakfast as a family meal. In a similar vein, Stouffer's launched the Let's Fix Dinner media campaign and website this year, created in partnership with CASA, one of the longest-running family dinner advocates. CASA, founded by Joseph Califano in the early 1990s, is the research group responsible for many of the oft-cited statistics that family dinner is a protective factor against teenage alcohol and substance abuse. What does it mean that big corporations are espousing family dinner? While part of me is skeptical, there is a big part of me that welcomes the money and resources that big companies bring in promoting what I see as an essential good. For major brands that sell food products at supermarkets, it is a positive trend if people eat at home more. I think the more people eat at home, the more routine it becomes and the better they'll like it. So first steps are important. I worry when the promoters are selling relatively unhealthy processed foods, but sometimes convenience foods may be necessary in order to get something on the table for dinner. There has to be a balance. Perhaps the more healthy foods, like vegetables, fruits, and whole grains need their own champion marketers, funded by the CDC, a consortium of California growers, or a major health foundation like Robert Wood Johnson. Or basic home cooking versus reheating convenience foods has to become a more common and valued skill. The experts like Weinstein and CASA have a responsibility to make sure the message of the importance of family meals gets out there without too many strings attached to the processed foods themselves. Stouffer's pizza for dinner or Smuckers jam on toast for breakfast are not the only way. Both these campaigns, though, seem to hit the balance very well, and are excellent and authentic in the information they present. So far, so good. I'm glad to seeing Weinstein on a bigger platform, touting the importance of family dinner in her approachable and non-judgmental style. Restaurant Contracts: Deal with the Devil? Fiber filled pillows – what you must know? Thank You for Celebrating Family Day 2016! Words and Content by Grace R. Freedman, eatdinner.org, 2007-2010. Theme images by YinYang. Powered by Blogger.